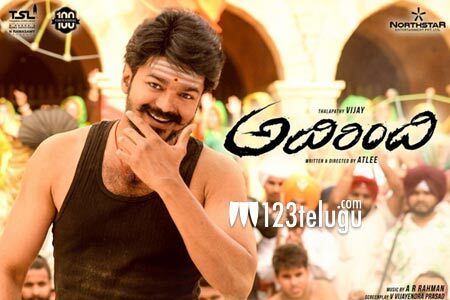 Adirindhi, the Telugu version of Tamil superstar Vijay’s Mersal, finally hit the theaters across the twin Telugu states yesterday. Mersal’s blockbuster success and the intense controversies around the film boosted Adirindhi’s opening day collections to a huge extent. In Krishna region, Adirindhi collected Rs.17,55,736 on its opening day. This is the best ever opening for a dubbed film in Vijay’s career. The film is surely going to utilize the weekend advantage and post decent collections over the weekend. Sardaar Gabbar Singh’s producer Sharrat Marar released Adirindhi in the twin Telugu states. Young Tamil filmmaker Atlee has directed Adirindhi. Nitya Menen, Kajal and Samantha are the film’s leading ladies and AR Rahman is the music composer.